Specialized equipment and training are needed to complete these actions. 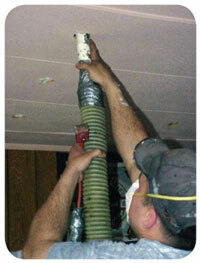 Contracted services should be used for actual insulation work. Most early mobile homes are very poorly insulated. Many have only 1 inch of fiberglass insulation in the roof cavities. The early roofs used a lightweight bow truss, a layer of insulation over the trusses and a seamed metal roof. The cavity under the insulation was usually left un-insulated, so insulating the roof cavity is one of the best ways to reduce heat loss in an older mobile home. It is a very cost effective, straightforward process. Newer Manufactured Homes will often have available attic space and can be insulated too. During the energy audit, you or the auditor will check to see how much insulation is in the roof cavity. A lot of mobiles have rounded “bow truss” roofs that are deeper in the center compared to next to the outside walls. The depth of insulation is tested by drilling one small hole in the ceiling in the center of the home (using the ceiling in a closet, if possible) and one near the outside walls. The cavity is probed to find out how much insulation exists in each spot and how much space is available for filling with insulation. The auditor will use that information to calculate the existing and proposed changes in heat loss through the ceiling, and will calculate the volume of the roof cavity to determine how much insulation can be added. Before insulating, any gaps to the interior ceiling adjacent to the furnace and water heater flues must be closed. This can be done by installing a metal shield using screws and high temperature caulk. Within the roof cavity, insulation baffles are installed around the flues (if necessary) to keep the insulation 2 inches away from the hot flue. Defective bathroom fans should be replaced. After examining the roof inside and out, the insulation contractor will decide on which type of insulation method is most appropriate. There are three principal options; interior blow, edge blow or ridge blow. There are advantages and disadvantages to each method. Your insulation contractor may have a preferred method. Interior blows, where holes are drilled in the interior ceiling, have several advantages. The most important consideration is that this method doesn’t damage the metal roof to minimize future roof leaks. If the weather is particularly bad, working indoors can be attractive. The crew will need good access to every room in the entire house. Homeowners should expect some mess and inconvenience during this process. Insulation is blown into the attic cavity from holes drilled along a line at the center of the ceiling. The contractor will mark the center at each end of the room and snap a line along the center of the mobile home. The contractor will locate each truss along that center line and place a mark on the ceiling centered between each truss. At the first mark the contractor will drill a hole using a 2-9/16 or 3 inch bit. If the outside edges of the roof can be reached with the hose from this hole, the contractor will proceed with marking and drilling holes along the entire length of the line from one end of the house to the other. The contractor will insulate the attic to 1.5#/ft3 density and will keep track of how many bags of insulation are used to maintain the proper density. Installers will monitor the integrity of the interior ceiling paneling while blowing to avoid over-filling with insulation and stressing interior ceiling panels. A second method of insulating roof cavities is called “Lifting the Lid” or doing an “Edge Blow.” In this method, the roof metal, which is essentially one big piece, is unscrewed along the whole length of the mobile. The edge of the metal roof is lifted up and a rigid pipe connected to the insulation hose is then inserted all the way to the far side of the roof in each truss bay. There are a few issues to consider with this method. First, opening up a roof exposes the inside of the mobile home to the weather. 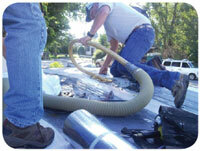 Some installers worry that by disturbing the roof, the home will be more vulnerable to future leaks. This work is typically done on the downwind side of the mobile to protect against a gust of wind. 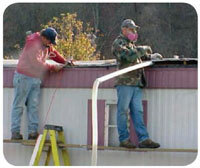 The first step a contractor will take is to set up scaffolding at one end of the mobile home. All screws along that side which hold the metal down to the side wall of the mobile home will then be removed. The roof metal is peeled over and the gutter is removed and gently set aside (to be reattached later). The edge of the roof metal is cleaned and any excess tape or caulk is scraped off. A visual inspection is performed to check the roof quality and construction. The contractor will then probe the cavity through to the opposite side of the roof, identify any strong backs, lateral stiffeners or other framing obstructions, and locate the placement of the existing insulation. Any wiring that goes from the walls into the roof cavity will also be identified. As with the “Interior Blow,” an insulation contractor will snap a line along the centerline of the roof and identify the location and spacing of the trusses. After cutting the first hole, the contractor will inspect the cavity and then figure out the best type of hose and method to use. The opening can be 4 to 6 inch round holes or 8 to 12 inch square holes. The contractor will feed the hose into each hole towards the edge of the roof and insulate the cavity to 1.5#/ft3. Each truss bay is insulated in both directions. After filling the bay, the crew member will remove the hose and repeat the process at the next truss bay. Often, the holes are located 4 feet apart at every third truss bay and the insulation is installed via the open truss webs. 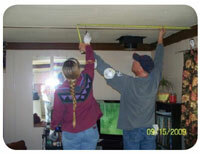 Insulating the roof cavity of mobile homes is relatively straightforward, inexpensive and yields big savings. People are warmer and the home is heated more efficiently.